A large freight elevator in a corner of the American Museum of Natural History leads up to the fifth floor production studio that staff members affectionately call “Santa’s workshop of the museum.” There, among the maze of half-completed reconstructions of animals, Rebecca Meah painstakingly glues quill-like feathers onto a model of a dinosaur known as Yutryannus huali, a feathered relative of the T. rex. Meah, a principal preparator, is one of the artists responsible for translating scientific concepts into stunning visual displays. Her job is to collaborate with scientists and curators to build the exhibits that are seen by the public. 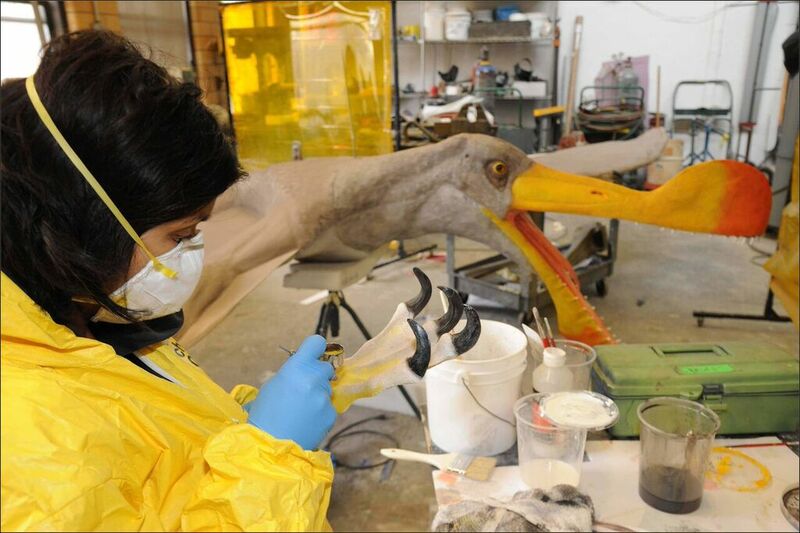 And her latest project, a life-size replica of a Yutyrannus, will be featured in the museum’s upcoming exhibition — Dinosaurs Among Us — about the evolutionary link between dinosaurs and modern birds, which opens March 21. 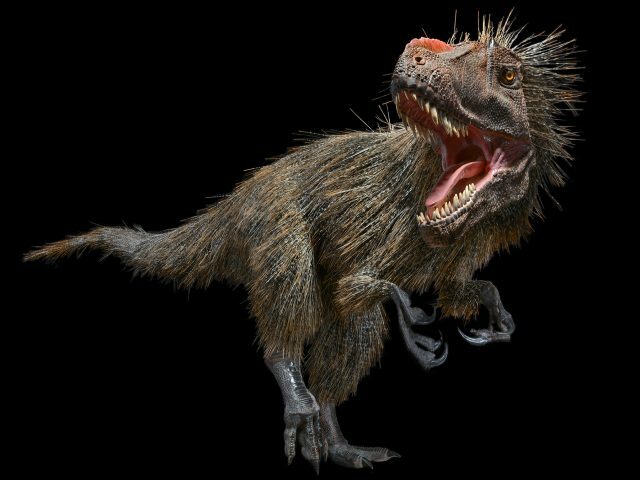 The 23-foot long Yutyrannus model Meah is making may not have the same bright green plumage as her parrotlet, but she made sure the Yutyrannus’s brown and white feathers are as scientifically accurate as possible. So Meah custom-ordered the feathers, and she and two other sculptors painted them by hand before gluing them individually onto the model. “They all have to be in the right direction, otherwise it will look like a muppet,” she says. Making the Yutyrannus scientifically accurate takes time and careful planning. Meah worked on it for nine months. She began by crafting a one-twelfth scale model. Then she made the detailed bits, such as the head and the feet, in clay and cast them in plastic. The rest of the body, however, is made by a much easier process. A polyurethane expanding foam is carved down to the rough shape Meah needs and then coated with resin for protection before it is painted. Meah says that making a scale model really gives an idea of the problems that may come up in a full-size model. It allows her to work out any design problems, such as an animal’s pose or position, so when it comes to doing the real thing there aren’t any unpleasant surprises. “The way we decide on poses — which way the animal’s head may be turned — depends on the size of the room we have to put it in and which angle viewers are going to see it from,” explains Matthew Miller, a preparator at the Smithsonian’s National Museum of Natural History. Although Meah does not have a background in paleontology or biology herself, she consults regularly with the curator and head of paleontology, Mark Norell. Together they decide what the creature will look like and what position it will be in. “We have some creative liberty but it has to hold up to the science as well,” says Meah. Meah, who comes from a family of physicians, says that science has always played a strong role in her life. “My parents wanted me to go to med school. But that wasn’t going to happen.” Instead, Meah decided to pursue a degree in painting and sculpture from the Maryland Institute in Baltimore. After graduating, she started a small business that specialized in theatre fabrication and model-making for various institutions and artists. After a few odd jobs, in 1996 a friend recruited her to help make some models for the American Museum of Natural History. That very first project involved the creation of trees that can still be viewed in the museum’s Hall of Biodiversity. In 2000, Meah was hired as a full time preparator. The models she has created since have been featured in the Hall of Biodiversity, the Hall of Ocean Life, the Hall of Human Origins and the Hall of Meteorites. But it was a pair of horses, her first large-scale animals, which opened up a new world of artistic and technical possibilities. But each model comes with a unique set of challenges. Insects need to look small and delicate. Fish need to look light and almost translucent to give the appearance of swimming. Birds or other models that need to be hung from the ceiling need to be lightweight but with just the right amount of steel structure inside to support the whole model. So Meah uses slightly different materials depending on what kind of look she wants for her model. And she sculpts their fins or limbs to be slightly bent in a way that looks animated — a task that is easier for animals for which there’s more anatomical information.